This practical handbook is an essential reference for GPs when dealing with musculoskeletal disorders, as well as a useful exam prep aid for the common MSK cases that occur in the CSA. Responding to increasing pressures on GPs to reduce the number of referrals and treat more patients in the community, the book covers a breadth of orthopaedic disorders, with clear colour photographs and diagrams to demonstrate techniques in practice. Chapters are authored by experts in each disorder with GP input, putting a strong focus on diagnosis and easy-to-follow processes for deciding courses of action and investigation. Each section explores the range of treatment options for that topic, including step-by-step injection techniques where relevant, and signposts need-to-know areas with ‘red flags’. 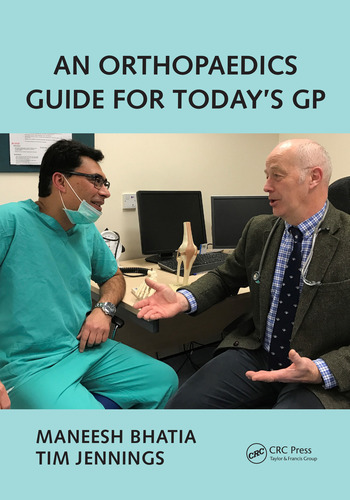 This is an important reach-for guide to assist GPs with easy diagnosis and to provide clear direction on next recommended steps.It will also be useful for medical students taking orthopaedics modules. Maneesh Bhatia is a Consultant Orthopaedic Surgeon at University Hospitals Leicester, with a private practice at Spire Leicester and Nuffield Health, Leicester Hospital. Whilst trained in a broad range of musculoskeletal disorders, Mr Bhatia specialises in foot and ankle surgery. He did his Orthopaedics training in Guys & South Thomas rotation, London followed by Foot & Ankle fellowships in Cambridge & USA. Mr Bhatia was European Foot and Ankle Fellow of the year 2009. Mr Bhatia has written on foot disorders for the Oxford Textbook of Trauma and Orthopaedics and is involved in a number of research projects. He runs regular GP Orthopaedic Training seminars and Joint injection courses. Tim Jennings qualified from Guy’s Hospital, London in 1981. He did his VTS training in Leicester from 1982-85. He joined Syston Health Centre, Leicester as a GP Partner in 1985 and continues to work here. He became a GP trainer in 1990. He became the programme director of Health Education East Midlands (HEEM) in 1990 and is still thriving in this role till date. He is School Medical Officer.